As more and more families are moving their entertainment and living areas outside onto the patio, deck or backyard, they’re treating those areas as rooms to be decorated just as their indoor spaces are. If you’ have always thought that area rugs were strictly indoor decorating items, then think again. 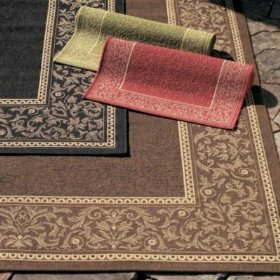 Outdoor area rugs can serve the exact same purpose outdoors as their less sturdy counterparts serve in your living room, den and dining room. In fact, since outdoor areas tend to serve multiple purposes, using outdoor area rugs to help separate and define the various purposes and uses of your patio or deck can be even more effective than it is indoors. 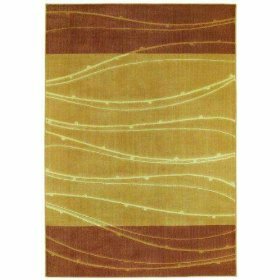 The use of olefin (also known as polypropylene), and the refinements to its manufacture over the past few decades have allowed rug manufacturers to create outdoor area rugs that are every bit as stylish and beautiful as their indoor counterparts. But you don’t need to be concerned about the weather affecting them – olefin is an amazingly durable fiber that resists fading and mildew, can be hosed down to clean it and dries quickly without fear that it will shrink or be damaged by the moisture. You can use outdoor area rugs to help set off a dining area from the rest of your patio, turning it into a ‘room’ by simply choosing a distinctive pattern that works with your patio table and chairs and using it as flooring beneath them. Mark off the end of the ‘pool’ by laying down an outdoor area rug that defines the edges of the patio conversation area, or pick an indoor/outdoor area rug in a bright, juvenile print to define a ‘kid’s corner’. A whimsical jungle print outdoor area rug in soft sheared olefin can soften the patio flagstones under baby’s knees, for example, if you fence off a baby play yard on your patio with a child safety gate, turning it into your little one’s own special outdoor room. By choosing patterns carefully, you can use outdoor area rugs to bring together conversational groupings surrounded by benches and planters, or emphasize a rustic country atmosphere with a homespun rag rug in 100% easy wash and wear polypropylene. Outdoor area rugs have come a long way since the days when your choices were limited to fake green grass carpeting. Take full advantage of the flexibility offered by today’s new generation of outdoor area rugs to make a definitive design statement on your patio or deck.